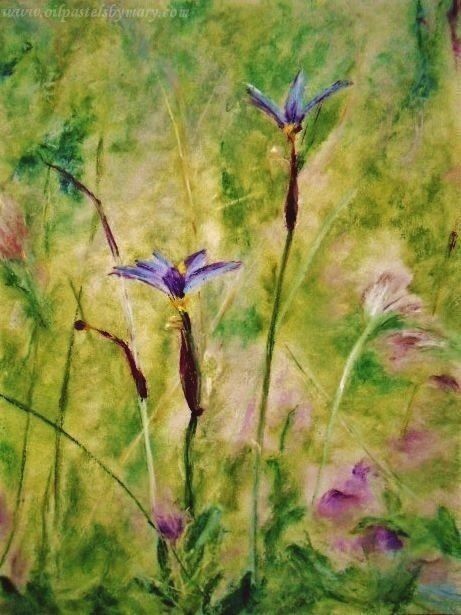 Here is my third and last painting of purple flowers, called Reach. It is part of a series that I wanted to finish before I began painting my favorite subject, landscapes – for the next several months (ha, I can’t wait)! 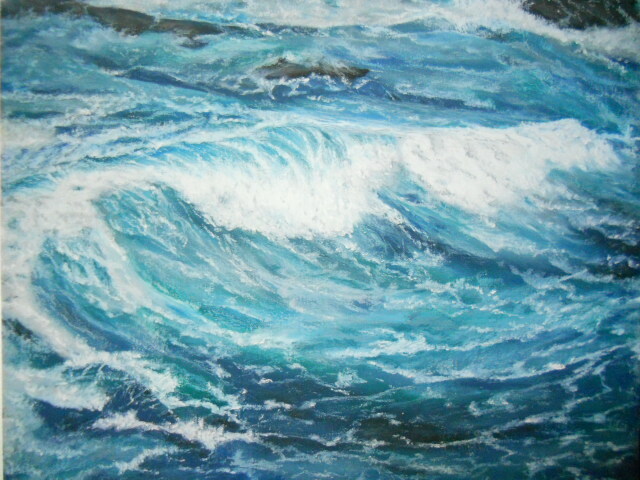 Reach, an oil pastel (12×9) was painted on Mi-Teintes cream tinted pastel paper, using mainly Senneliers, Holbeins and Mungyo-Gallery. My intention was to have the background a bit more medium-to-light gray but once I got going it seemed that the green-yellow hues were fitting the piece better, making the painting more light-hearted. This entry was posted in About Oil Pastels, OPs New Paintings and tagged flowers, oil pastels, painting, purple. Bookmark the permalink. Thanks so much Violet – lovely to hear from you today! Thank you Calee, so glad you enjoyed the painting. Cezanne like suggestive color and strokes of the burgundy flowers. Thank you for your nice feedback – I see you got what I was trying to do with the background flowers. Moving on to the beginning of my landscape season. Those colours make me smile with joy, Mary! Thanks Ann-Christine – just a bit of Spring to warm everyone! So. You love painting landscapes, which seems to indicate that you don’t so much love painting … other stuff. In which case, I can hardly contain myself !!!!! Ha, M.R. landscapes are great fun to paint – so hold on it’ll be a little while. Thanks Z! I’m going back into it later today – the background is in a struggle with the foreground, so I think I have to push it back a bit. We’ll see what happens when I start to scrape it down. Can I salvage it? Never know. hey.. it looked great to me, but i totally understand that push/pull conflict. you’ll make it even stronger! We’ll see – someone mentioned the colors were coming forward and I realized my error and should have grayed the greens to push the background back a bit. All in progress. and i did the opposite last night.. i’m working on a 9-foot wide ‘mural’ for a restaurant at the beach.. we’re going to glue the fabric to the concrete wall…. i warmed it, and it is more ‘believable’ thought not as painterly! i should be able to share this on thursday’s timeout for art. i worked late last night, but there’s this EXCAVATOR working by the house and the house is shaking, bells and whistles beeping, and the sound of the bucket making the trench where fresh water will flow to the shrimp – eventually…. i tthink i’m goin to take a break and go to town for lunch and clear my senses! Can’t wait to see the painting Lisa – sounds like this is going to be another masterpiece for many to enjoy. I liked reading your thought process and then how you critiqued it. Looking forward to the post – I’m a bit late getting back to you on this, sorry. no apologies needed.. i may never catch up with comments – until the desktop is connected again, it’s hard to find old comments – the screen is small, and the window doesn’t show much. computer’s been offline since september – can you imagine how many updates it will need to install when it is connected with the www?!!! i painted til daylight, worked on the post then went to sleep at 7:30.. i feared the internet wouldn’t upload photos if i slept first! it’s being nice – shhhhhhh, don’t wake the baby! Crazy, Mary, but I’m not seeing the painting which I’m sure is my loss. Hi Lulu, I just went into check and the painting is there – you might want to clear out cache or unfollow my blog and then follow, it might reset it. Thanks for letting me know. Thanks. The sensitivity in your work blows me away. Wonderful spring feeling. Just gorgeous Mary! I’m glad the green won! Thanks Marina. There is such a fight going on within this painting, I think that I’ll be scraping it down an bit and see if I can’t push that green back a bit.